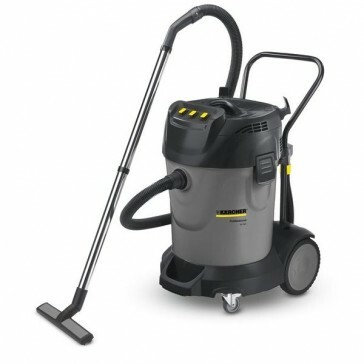 The NT 70/3 is a tough, high capacity vacuum cleaner designed for demanding professional use. With 70 litre container capacity, tough construction and high manoeuvrability, the NT 70/3 is equally suited to use in workshops, manufacturing, and vehicle valeting. The machine's three independently-switched motors ensure high suction power when required, and economy and reduced noise when only one motor is needed. Large bumper with accessory storage. The container is easy to empty via the drain hose, a clear advantage given its large 70 l tank. The NT 70 has an ergonomic push handle for greater manoeuvrability. The robust bumper protects the vacuum cleaner from knocks and bumps.